There were four beds in the room. Two beds side-by-side, and across the room two more stacked as bunk beds, five and a half feet high. Between these beds ran a narrow “T,” not room enough for young brothers to pass without bumping shoulders, or a quick poke to the ribs. On a weekday after school, our mother would tell us to go outside if we were going to fight. We did enjoy the outdoors if we were carrying a ball, but going outside to fight was an exhausting concept for us. She knew this, so the fighting stopped. Until it started again. If it was a weekend our father would cross through the doorway to tell us to break it up or he’d break it up for us. It was not a minor threat. He had followed through on it before, most recently leaning over one of our beds to swat us. He missed. I didn’t want to get smacked this time, nor did I want to see him miss again. Both came with terror. When my brothers were gone from the house, and my father was at work, far away in an office I had never seen, the room was mine. I’d leave it to go to the hall closet where our stereo was kept, part of an elaborate sound system the previous home owner had rigged, with speakers in several rooms wired back to a boxy amplifier and turntable. Without having to ask permission I’d pick a record and play it through the one small speaker in my bedroom, sometimes playing the same song over and over. Maybe it was Roger Miller’s “King of the Road,” or The Beatles’ “Taxman.” At 12 I had yet, unlike Miller, pushed a broom for the pleasure of staying in a cheap hotel, nor did I dream of taunting, like George Harrison, the Queen's revenue producing agent. Whereas Roger was carefree and George the serious Beatle, I was neither. I lived in that huge, confused state of the in-between. 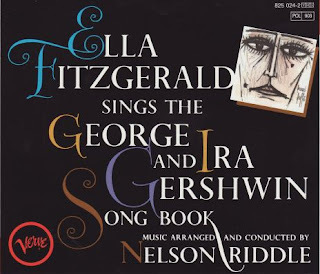 More often my choice was one particular song from Ella Fitzgerald’s Gershwin Songbook: “They All Laughed,” and I would join Ella, and then she would step back, let me solo. As I sang I gained confidence and volume, the only voice I heard while declaring how they had laughed at Christopher Columbus and his round planet theory, at Thomas Edison for his wacky recording device, and then at Rockefeller Center—a very classy real estate project in the center of the universe, New York City. They laughed. Imagine that. What hicks! And their biggest laugh was saved for me and my expectation that a young lady, a schoolmate, with the glorious name that I will not reveal, whose parents I think were born in France, would fall for me. It was believable that in these circumstances they would have a good laugh. I had been laughed at regularly, some good-natured, but there was the unexpected teasing, and I was never in on the fun. But who didn’t dodge such repeated darts through middle school? Or who, like me, needed to grow oblivious to the mockery because he or she spoke with a stutter? Yet out of this world I was armed with a phalanx of Hollywood studio musicians. With the coolest string and horn sections at my side, I became the equal of a great explorer, a wily inventor, and a big money family of bankers, politicians, and real estate developers. Each and everyone a success story, and I was about to join them, another stanza in Ella's song with Nelson Riddle conducting. The folks doing the laughing, however, still held on to the notion that I was a goof, overreaching when it came to love, too dumb to realize that my one, true desire would never pause to squint at me, the kid who had succumbed to his Catholic school's fashion edict, the white shirt and the salt and pepper cords. Yet it was time for the laughers and the teasers to hear something far worse than any stutter. It would be the repeated chuckles and chortles and giggles, directed from me (and my gal) to them. They were the losers for having failed to believe that the young lady with the glorious name that sounded French, which was more proof that her parents were from France, or some really great place like that, had, in fact, fallen for me. My lunch recess plans were now her lunch recess plans. And vice versa. The angry young man was angry no more. I was happy. I was feeling good. On three, studio musicians, on three: a one, a two, a . . . Ha! Ha! Ha! This was a good thing for me to learn at that age, or for any kid; it was a dream that I could have the last laugh someday; it didn’t matter what I did or where I was going. There was trouble now, but trouble would not reign forever. All of this was made believable by the easy confidence that this woman expressed with her joyful voice; her face and figure might be flawed, but so what? She could sing and laugh better than anyone. 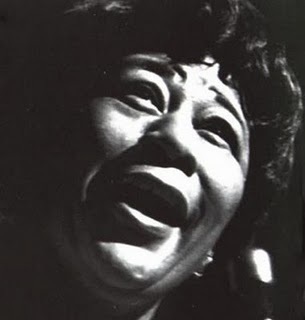 This was Ella Fitzgerald. I just saw her in the Abbott and Costello movie “Ride ‘Em Cowboy” from 1942. In one scene she is on a tour bus with a bunch of swinging ranch hands, each dressed for a Sunday morning meeting at the Church of Big Hat, No Cattle, with the honorable cowpolks Bud Abbott and Lou Costello presiding. Up and down the bus aisle she twisted and turned, singing about a brown and yellow basket that she had lost; she pouted, she worried, she felt terrible that it was gone, but we knew she didn’t, not really. How could she? It was an Abbott and Costello movie, not Stanislavsky State U. alums doing Bertolt B. It wasn’t the blues, baby, sadness or grief; it was, at best, faux chagrin and very entertaining. This was the kiss of anti-cool: she was not serious; she was not, and this could be damning for some listeners, like Billie Holiday. But not for Ella and me. Ella had the heart and the smile, and they could be ours too. Billie had the pain and the voice, each so perfect that both could only belong to her. For a middle school kid, perfection was something that did not seem possible, and if it was, it was something that was a long way off, like after you picked a major in college. Just good enough would be good enough for now. That girl of French parents wasn’t perfect, and neither was I. My dream girl had crooked teeth, but I had never noticed them. Some cynical classmate had to point them out to me; she needed braces, he said, dismissively. I wasn’t all that confident that I would ever be fluent, but all that drifted away when Ella encouraged me to sing. There were better things to think about than our imperfections. She had that great voice, but she’d tell you that she didn’t look all that hot. Nobody ever said that about Billie; she was gorgeous, so dancers, actresses and singers yearn to play her. And some eventually do. But no one ever gets cast as Ella. Not really, because she'll stand back and let you sing your own song, in your own perfect voice, as loud as you can. Who’s got the last laugh now? "